Obama wants fewer standardized tests. How serious is he? Can the Obama Administration Really Pare Back Standardized Testing? Under new guidelines, students are supposed to spend less of 2 percent of their time taking standardized tests. But that still leaves time for plenty of testing. Is President Barack Obama serious about changing American schoolchildren’s relationship with standardized testing, as he seemed to indicate last weekend? Can he really curtail the testing that has run rampant in our classrooms over the last decade and a half? And does he even want to? Last Saturday, Obama—a longtime proponent of “accountability,” that byword for these federal, state, and district tests kids are regularly taking to make sure their schools are educating them properly—made what appeared to be a big-deal announcement: American kids are tested too much, and it’s time we stepped back from the cliff. In what seemed like an even more shocking about-face, the Department of Education issued an accompanying action plan admitting that the “Administration bears some of the responsibility for this, and we are committed to being part of the solution.” So it looks like our children will finally be freed from the yoke of the approximately 112 standardized tests they are now forced to take between pre-K and graduation—right? These days, the testing landscape in the U.S. is dotted with landmines. In the decade-and-a-half since No Child Left Behind enshrined the practice of federally mandated annual standardized testing, and the five-and-a-half years since Race to the Top incentivized states to show growth in test scores, standardized tests have proliferated in schools, to the point where kids now sit for an average of eight standardized tests a year. Today, as a parent, I want to know how my child is doing in school, and I want my teacher to know that, too. As president, I want to hold all of us accountable for making sure every child, everywhere, is learning what he or she needs to be successful. That’s why I believe that in moderation, smart, strategic tests can help us measure our kids’ progress in school, can help them learn. In other words, testing is a necessary not-all-that-evil—as long as the tests are “worth taking” and “enhance teaching and learning” (whatever that means). For the Obama administration, testing is a civil rights issue: If you don’t assess kids every year, you won’t know which ones are struggling. Fine. But even as Obama says he plans to “work with states, school districts, teachers, and parents to make sure that we’re not obsessing about testing,” he’s silent on the stakes attached to the testing, from tying teacher evaluations to student test scores to closing schools. And as long as those stakes go unchanged, all this tut-tutting about overtesting will be mostly hot air, and the “obsessing” will continue. Because while the federal government has a very small role in determining the number of tests students take each year (the implicit focus of Obama’s statement), it can punish schools that underperform (which Obama didn’t mention). 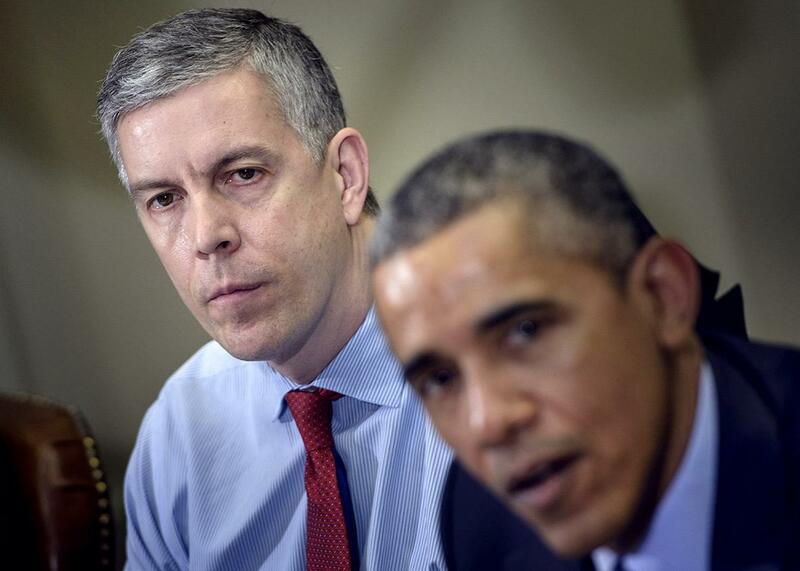 Secretary of Education Arne Duncan listens while President Obama makes a statement to the press after a meeting with the Council of the Great City Schools Leadership in the Roosevelt Room of the White House, March 16, 2015. Instead, Obama said that tests should be “smarter,” less redundant, more consistent. Oh, and that they should be “time-limited,” capped at a mere 2 percent of the school year. But in a Council of Great City Schools report, a two-year study of testing in some of the largest urban school districts that was released last Saturday, only eighth-graders, who sat for tests for approximately 2.3 percent of the school year, took tests that exceeded that bar. The rest of the administration’s recommendations are equally amorphous—more flexibility to states, an executive encouragement to pare down testing, but no substantive policy shift. Details, we’re told, will be unveiled in January. Farida Mama, a fifth-grade math teacher at an in-district charter school in Boston and a policy fellow at Teach Plus, a national nonprofit group that seeks to help teachers influence education policy, was one of the two teachers who met with Obama on Monday. She said she is pro-testing: “I believe that for equity and civil rights issues, it’s essential that the government holds all schools and districts accountable for student achievement.” But, she went on, “In our efforts to get data we sometimes forget how quickly the tests can add up.” Her fifth-graders take the Massachusetts Comprehensive Assessment System test, school- and district-mandated benchmark assessments, and teacher-created unit assessments. But Katie Lapham, who teaches second and third grade English as a second language at a Title I school in Brooklyn, New York, and is involved in the growing opt-out movement in New York state, was disappointed in Obama’s statement, for several reasons. “First, he didn’t say anything about the high-stakes nature of testing. 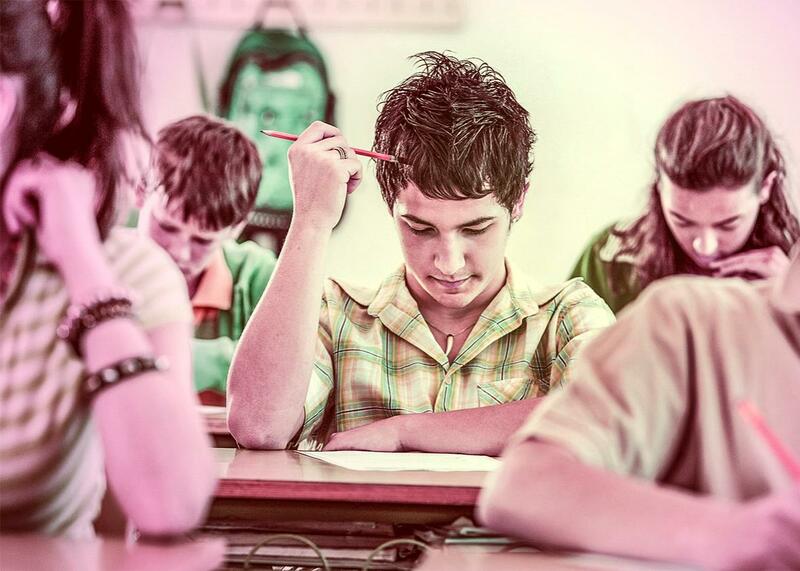 Even capping the tests at 2 percent—that’s still 25 hours of standardized testing. He also said nothing about test prep, which is huge. At schools with low test scores, the pressure to raise test scores remains really intense,” Lapham said. “I’ve only taught at schools with low test scores, where we have a lot of students living in poverty, a lot of students with special needs, and a lot of English-language learners, and they don’t tend to do as well on the state tests. Everything we do is with the test in mind,” she said. Obama’s announcement does nothing to relieve that stress. Of course, as the administration certainly understands, the potentially imminent passage of the new Elementary and Secondary Education Act might render most of this talk irrelevant, since both the House and Senate versions that were passed this summer shift a significant degree of power back to the states and school districts. As for what happens if ESEA, which is currently in the conference process, isn’t reauthorized, Monty Neill, the executive director of the National Center for Fair and Open Testing, or FairTest, who was critical of Obama’s “nothing proposal” on testing, said, “I can’t see any of the candidates can plausibly attempt to restore” No Child Left Behind as we understand it. “Both the House and Senate bills effectively prohibit the secretary of education and the administration from doing much of anything to states, certainly around testing and accountability issues” that flourished under Race to the Top, “in which case there’s not going to be much for the next administration to do.” If ESEA isn’t passed, the whole circus starts over again. In the meantime, Obama is offering not a sea change but a tweak—tossing a bone to the angry teachers and discontented suburban parents who’ve been banging on his door. And the stakes—for teachers, for students, for schools—hang in the balance.